Piotr Szyhalski has presented several spectacular eight and a half hour performances at Northern Spark including Empty Words and Permanent Labor. 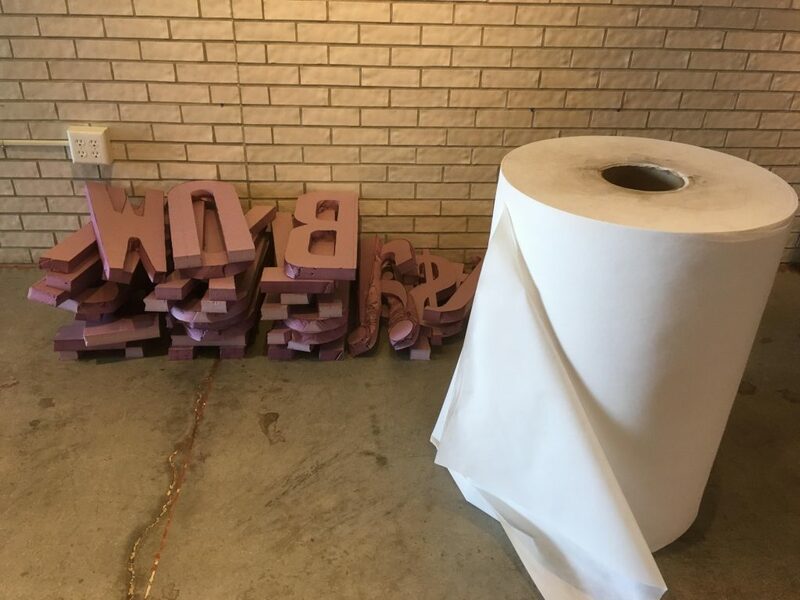 Recently, he has been working with large format printing processes, using letter forms cut from insulation foam and hand printed on a roll of tyvek. The series of works is both a way for the artist to have a prominently visual voice in the issues of the day as well as a platform for the expressions of others. 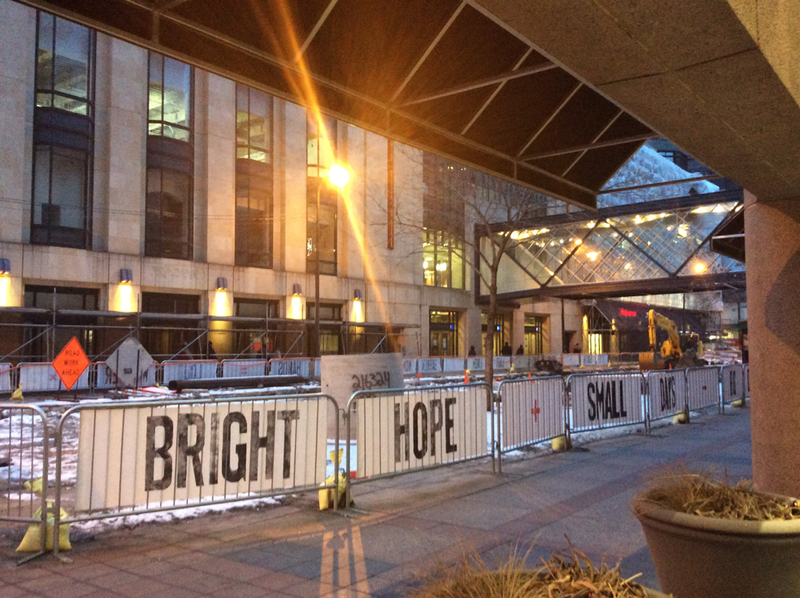 Northern Lights.mn is excited to have the opportunity to present a new temporary installation, Living Banners, along the renovating Nicollet Mall as part of The Great Northern festival. Steve Dietz: Piotr, what is your elevator pitch version of Living Banners? Piotr Szyhalski: No elevator pitch. Maybe a street pitch? There are just too many aspects of the project that I find exciting and important to boil it down to a sentence. But two themes are top of mind. On one hand Living Banners is simply about language. The malleability of it, the organic, living, evolving nature of words and meanings; of ideas occupying spaces between words. 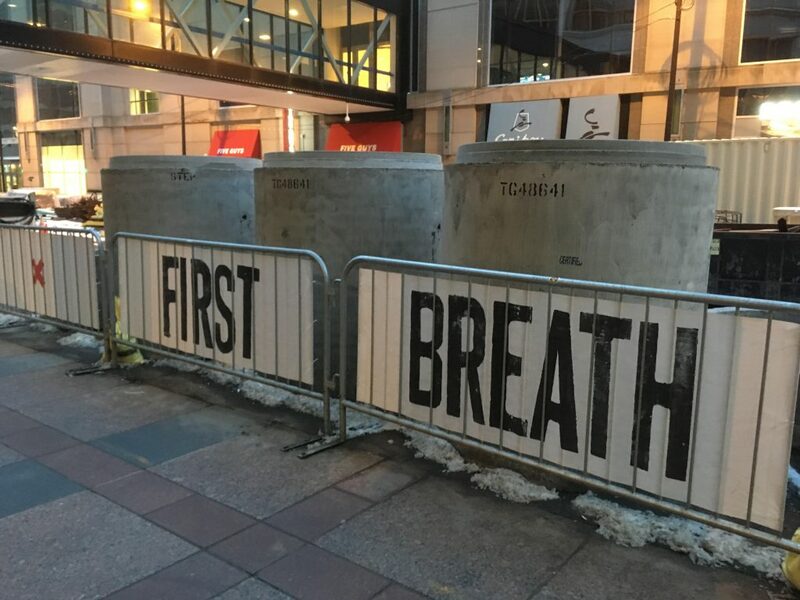 So, when you approached me with the suggestion of a project taking place at Nicollet Mall, I immediately thought of the construction site as a kind of grand metaphor for how we “work things out” in our heads when we attempt to express something complex, nuanced, or important. There is a kind of struggle that is taking place in constructing an idea. SD: How did you make the Living Banners, and who did you work with on it? I began by cutting the letterforms that would fit the specifics of the barrier size. I have worked with a similar process before, and the unique esthetic quality of the hand-pressed letter forms is something that I appreciate very much. There is a different sense of appreciation in the objects which are clearly hand-made, especially at this scale. 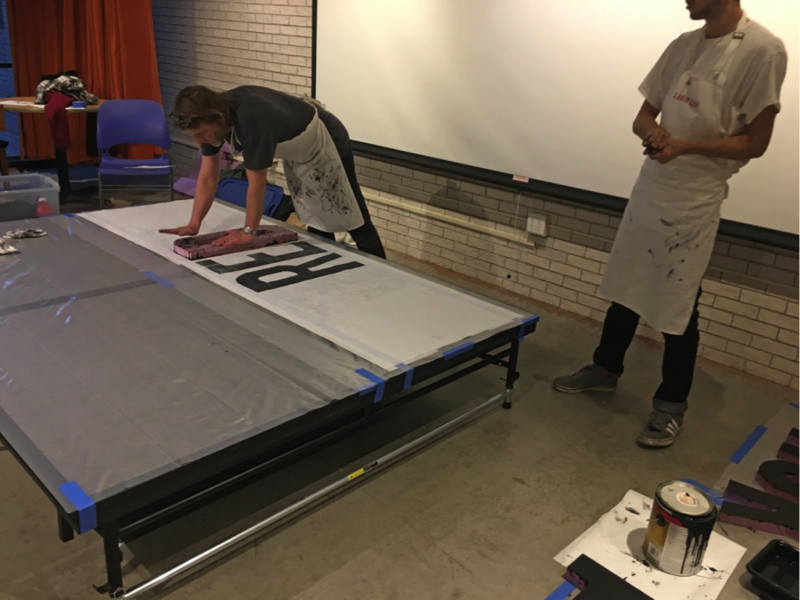 In the end, all the banners have been printed one character at a time, which means that there were more than 2,000 unique letters inked and hand-pressed. This truly mammoth task would be absolutely impossible for me to tackle as an individual. For a couple of years now I have been fortunate to work closely with a collective of amazing students from the Minneapolis College Of Art And Design operating under the name The People’s Library These inspiring young artists worked with me at every stage of Living Banners, infusing it with the true spirit of collective energy and creative power. 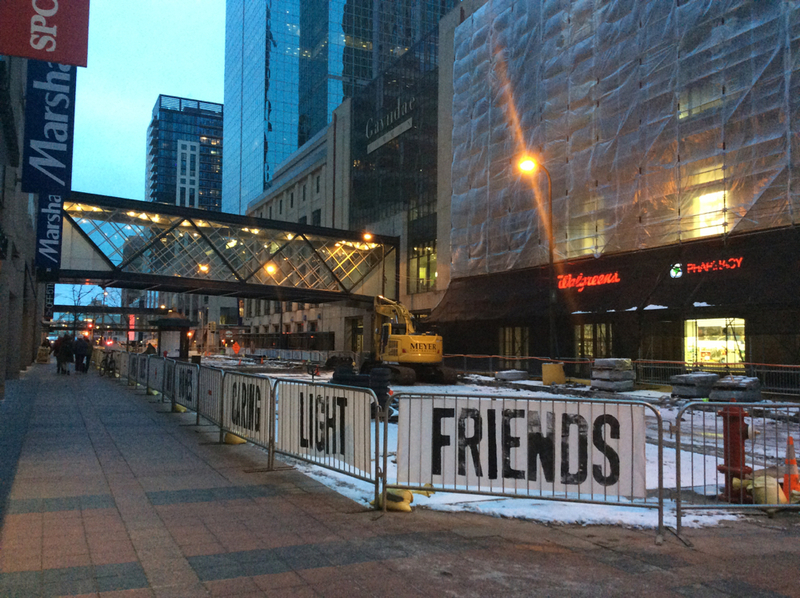 SD: On one level, Living Banners “wraps” Nicollet. As I was walking the circuit last night, the obvious handmade nature of the banners made me think of them almost like cartoon thought bubbles for a “people’s voice” that operate as a subtextual commentary to all the branded and directional signage that we are constantly bombarded by in the city. Something magical happens as we bring two words together, and Living Banners thrives in that energy. I built two lists of words: adjectives and nouns. From this list each word was printed three times. 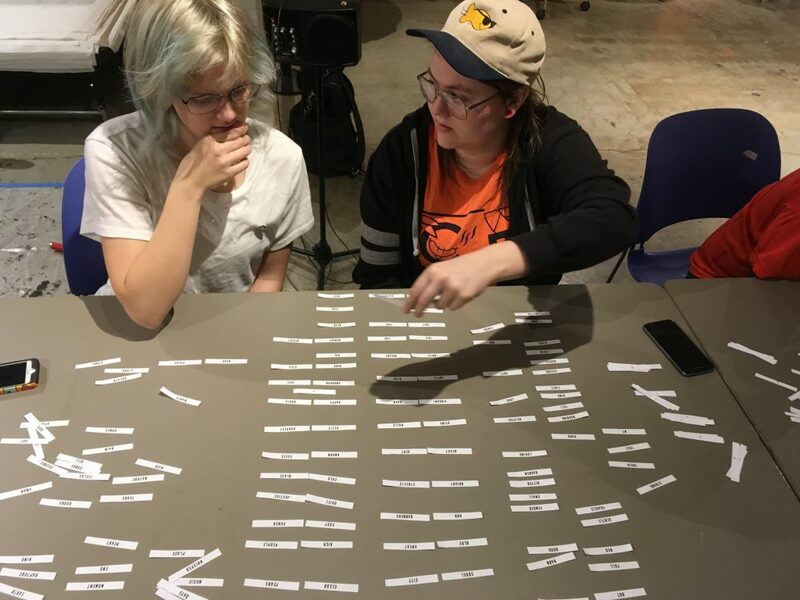 After all printing was done, The People’s Library and I spent some time arranging tiny strips of paper with 400 words on them to lay out the initial sequences that were installed on the Nicollet Mall. In addition to the new meanings that emerged from word combinations, I introduced the mathematical symbols as a visual structural device, suggesting combinations of these statements into larger sequences and more complex thoughts. To me, the “connector” banners printed in red also encourage a broader sense of play, and awareness of context. 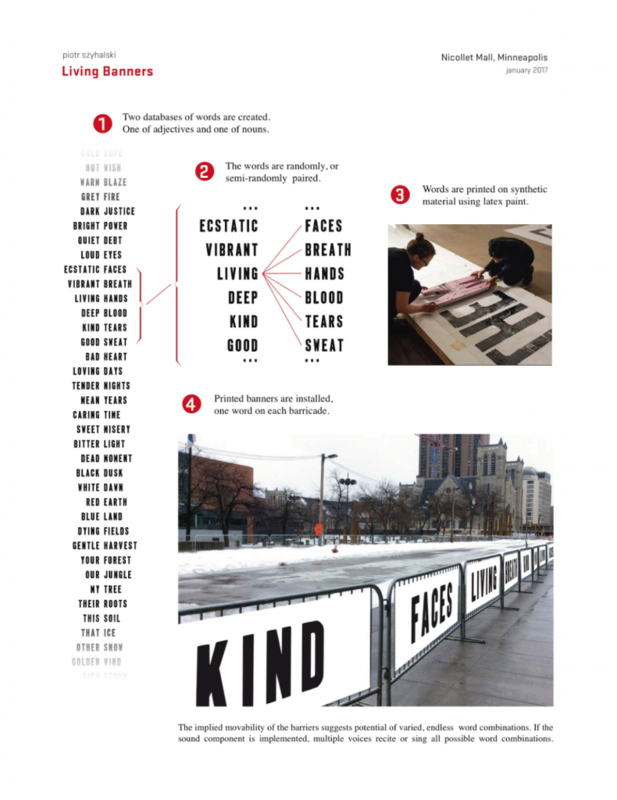 One of the more exciting aspects of installing the project on Nicollet was seeing how the words interact with the space, locations, construction machinery, and other objects. 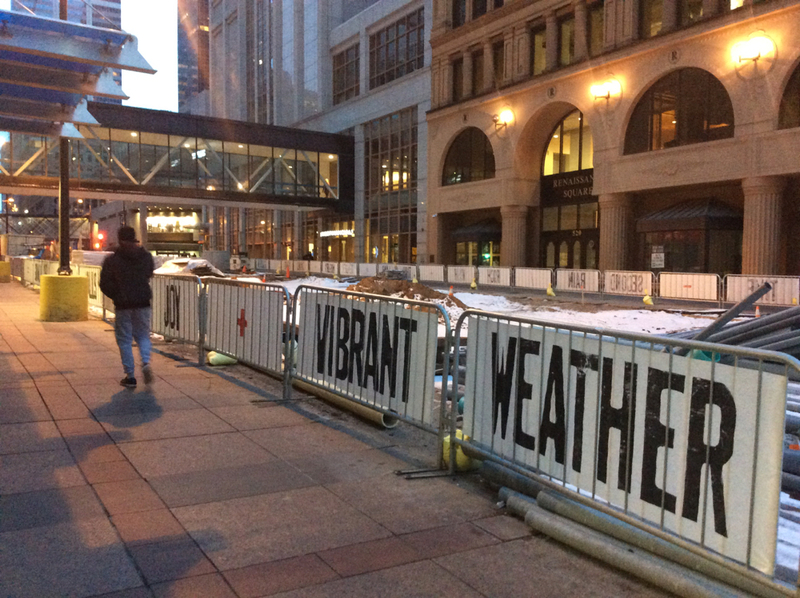 SD: Living Banners runs from the west side of Nicollet Mall at 12th street north to 5th street and back again on the east side. As you walk this nearly mile circuit, stopping and starting wherever you want, there is a natural desire to want to read a story in the words. But there isn’t a traditional linear narrative. Why? PS: At this scale, in this particular environment, the language, the words, and all the ideas they imply, begin to feel more like a place than a story. A point of convergence where our own interpretations and thoughts connect and weave a large complicated narrative unfolding in multiple directions simultaneously. There is a beautiful opening scene in Wim Wenders film Wings of Desire where angels swoop through the streets of divided Berlin listening to the thoughts of people caught in their daily lives. A beautiful, chaotic poetry emerges from these jumbled thoughts of many individuals. There is no one story here, because here, all the stories happen at the same time. SD: As you said, every pair of words is separated by a red operator: a plus, minus, multiply, divide or equals sign. This reminds me of a formula to be solved, almost like a mystery of meaning. But it is also open ended. Open to interpretation. What does Living Banners “mean”? PS: If I had to define the meaning here, I would say that it suggests the fact that there is no one meaning. Each unique word appears three times in the piece, each time in combination with a different word, effectively changing its meaning. The same words mean very different things to different people, at different times. I want to bring that simple realization, to a moment one has walking down the street. Open up a possibility for contemplation, for questions, for new ideas. 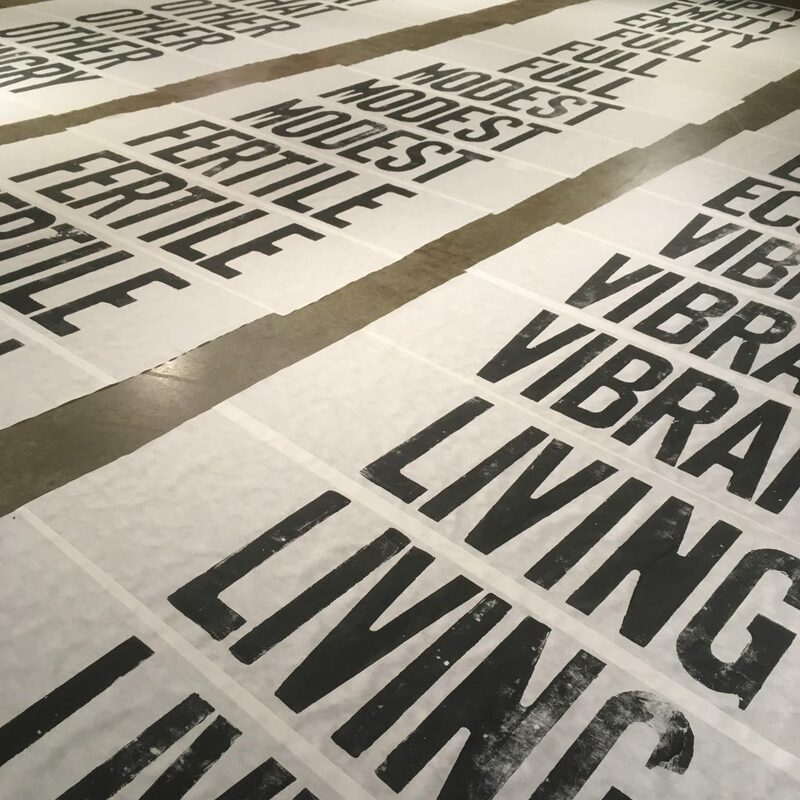 SD: From one perspective Living Banners is a database of words. A subset of language. You and The People’s Library have strung them together in a starting order, so to speak, but just as the “ped” barriers to which they are attached can be detached from one another to be reconfigured, the operators encourage readers to do this mentally. Can you comment on the role of choice in making meaning in our lives? PS: For all the poetry and complexity emerging from this playful mingling of ideas, we know how powerful words can be. Especially today, the understanding of how language changes perception is crucial. It’s so easy to fall under the spell of rhetoric, even demagoguery, and embrace one-sided political discourse. Which is why I feel a certain sense of urgency in creating spaces that foster critical thinking and encourage questions, rather than providing easy answers. 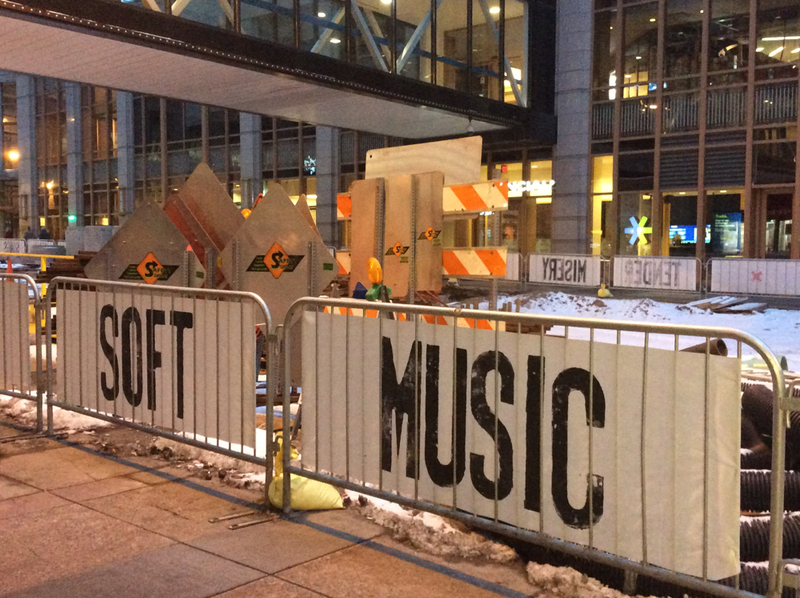 SD: Nicollet Mall is currently under construction. I love the way Living Banners takes the messy infrastructure of in-process and makes it support our imagination of what might be. SD: Living Banners is part of The Great Northern, “a showcase for The North at its wintry best.”. You’ve lived in Minneapolis for over 20 years. What is the relation of Living Banners to winter? PS: One thing that I always love about winter is the sense of camaraderie that emerges from our shared experience of harsh weather. Yes, it can be truly beautiful, but it can also be terrifying and depressing. Along that entire spectrum, we tend to bond with one another. With the social media and the virtual lives we live online, it seems that we “bond” less directly these days, from the comfort of our homes. In that context, Living Banners activate again the actual physical space, in which a shared experience can occur. We bond in/through our ideas, right in the heart of the city. SD: What would you say to someone who thinks some of the phraseology of Living Banners is rather bleak, at times? PS: I was recently reminded by artist Amos Kennedy that we need to appreciate the darkness, because it allows us to see the stars. I can’t think of a better way of thinking about this. Life is beautiful because of the plethora of ways in which light intersects with darkness. 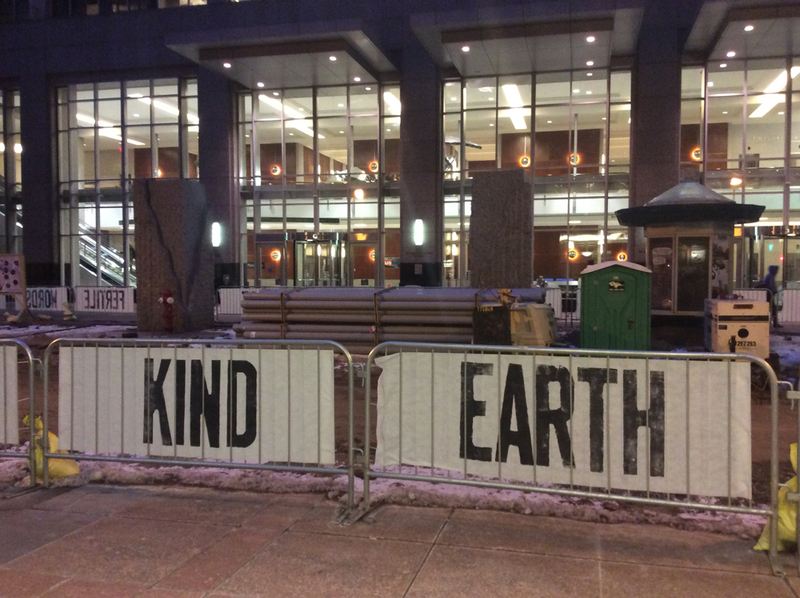 As you walk along Living Banners you will find that different sentiments resonate with you in different ways. Our lives bring certain ideas to the foreground, and push others back, only to change our emotional priorities entirely a day later. PS: My last words here would be to simply express my thanks to Northern Lights.mn and the Minneapolis Foundation and the Downtown Council and Downtown Improvement District and The Great Northern for making this project possible. I am proud to live in a community so supportive of art and a city which understands the fundamental role of culture in our society. Last, but not least I want to once again express my complete awe and gratitude to The People’s Library for their tireless effort in seeing this project through to completion. It is inspiring and humbling to work hand in hand with these young artists, who consistently demonstrate their courage and commitment to art. Our future is in good hands! Piotr Szyhalski is Professor Media Arts at the Minneapolis College of Art and Design and the founder of Labor Camp. He has exhibited widely internationally. A retrospective of his work will be presented at the Weisman Art Museum in the summer of 2018. The People’s Library members are: Nancy Hicks, Candice Davis, Jonathan Herrera, Davin Tuller, Mad Radtke, Nico Sardina, Kai Greiner, Christopher Schuldt, Zoe Cinel, Brandon Tagle, Carly Haack, Jonathan Thomas, Bethany Johnson, and Kendra Ruesken.